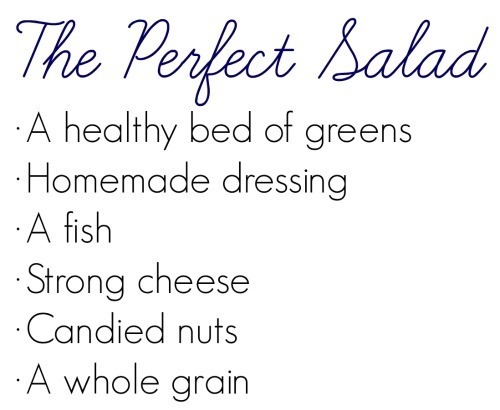 What would be on your ideal salad? Mine would feature a great balance of nutrition and flavor. My goal when building a salad is always to get a good mix of flavor, texture and macronutrients. In this case we go super healthy with local greens and canned salmon. A perfectly seared piece of salmon would be ideal, but on this busy Monday canned was most efficient. I knocked out protein, omega-3s and vitamin D in one fell swoop. Healthy fats also come from an olive-oil based dressing, a local cheese (plus more calcium!) and the almonds. Yes the almonds have some sugar and butter involved, but the amount is relatively low when mixed in sparingly. And the flavor is oh-so-powerful! I don’t believe you have to have a diet completely void of sugar to be healthy – I just think it needs to be in small doses or on special occasions. Finally a meal is not complete for me without some long-lasting complex carbohydrates. Today they came in the form of a spinach feta roll from our bakery, but any kind of complex carbohydrate will do: sweet potato, cooked wheatberries, whole grain croutons, brown rice, toast. I can eat all the protein in the world, but if I don’t have at least a little carbohydrates at lunch I’ll be hungry an hour later. This lunch kept me full for 4 hours, when I had a few almonds while making dinner. 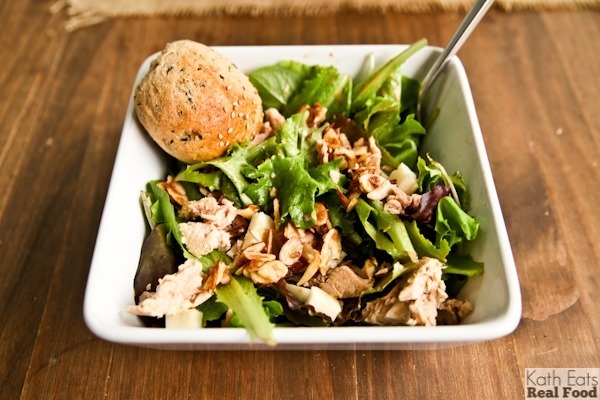 Here are two of the mini recipes I used to make this one smashing Hugh Jass salad! 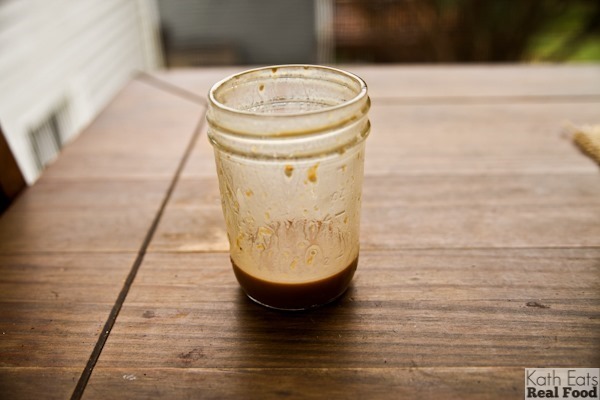 This dressing has hints of orange, sweetness from honey and creaminess from Greek yogurt. The perfect hint of creamsicle! Combine in jar and shake well. Nothing makes a salad like the sweet, crunchy spice of candied nuts. My spiced pecan recipe is a favorite, but these almonds come together in just minutes in the microwave for those days when you’re a bit impatient. You can certainly make these on the stove top as well if you wish. Combine first 4 ingredients in a bowl and microwave for 15 to 20 seconds. Stir to mix. Add almonds and coat with mixture. Allow to cool before enjoying on your salad. What’s atop of your favorite salad? Your blog is great. I wish I had discovered it sooner– I’m using so many of your recipe ideas in my everyday life. That dressing sounds INCREDIBLE. I love orange flavor in dressings. I made a delicious salad a couple of weeks ago with pears, gorgonzola and walnuts. The dressing was what made it (red wine vinegar, Dijon mustard, honey, and olive oil). For some reason, I always need nuts and gorgonzola/blue cheese on my salads. This looks nutritious and delicious! Lately I’ve been loving roasted sweet potatoes on everything, salads included!! My favorite salad is one that is easy to put together based on what I have in the fridge and pantry. Plenty of greens, roasted/cooked/raw veggies (broccoli, brussels sprouts, cauliflower, zucchini, squash, asparagus before I found out I am sensitive, parsnips, carrots, sweet potatoes, peas, tomatoes, cucumbers, mushrooms, peppers, artichokes), chicken, salmon (my favorite) or an egg for protein, avocado, olives, hummus, or nuts for healthy fat and often a few grapes, orange segments, apples or pears. Right now I am trying to reduce grains and dairy due to finding out I have Hashimoto’s (hyperthyroid autoimmune disorder). Looking forward to my Hugh Jass salad for lunch (I am always amazed at how Hugh Jass my salad ends up being). Thanks for sharing yours. I will definitely be trying the dressing and nut recipes. this salad sounds delish! Love the microwaved nuts that’s such a special touch. 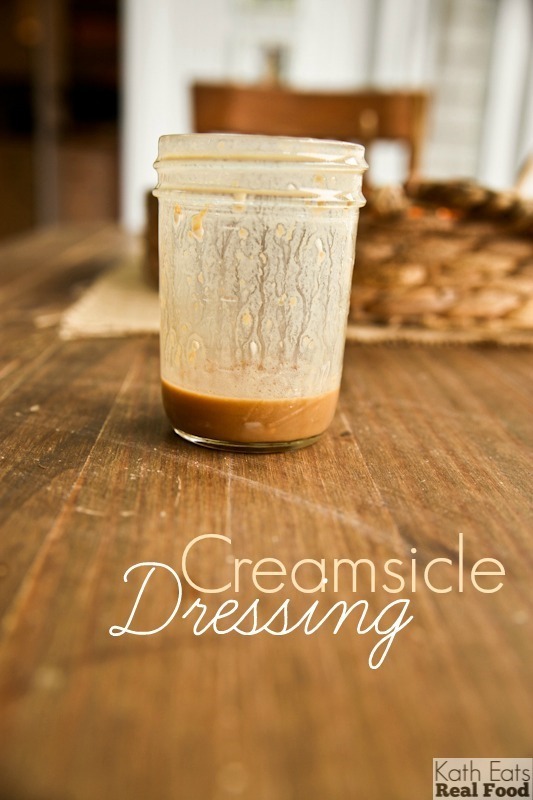 I’ve been obsessed with orange dressing lately and will certainly be making this creamcicle dressing soon. Thanks for sharing! 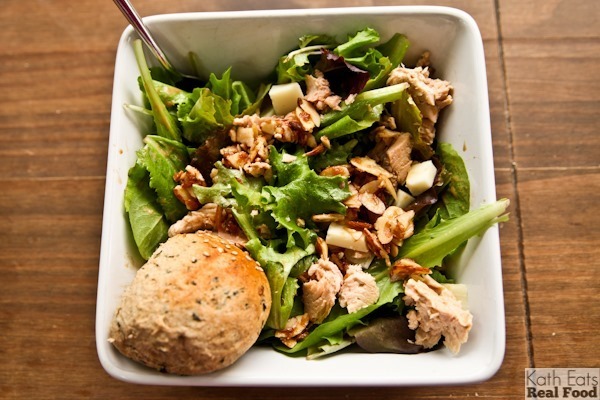 I love canned salmon on salads! 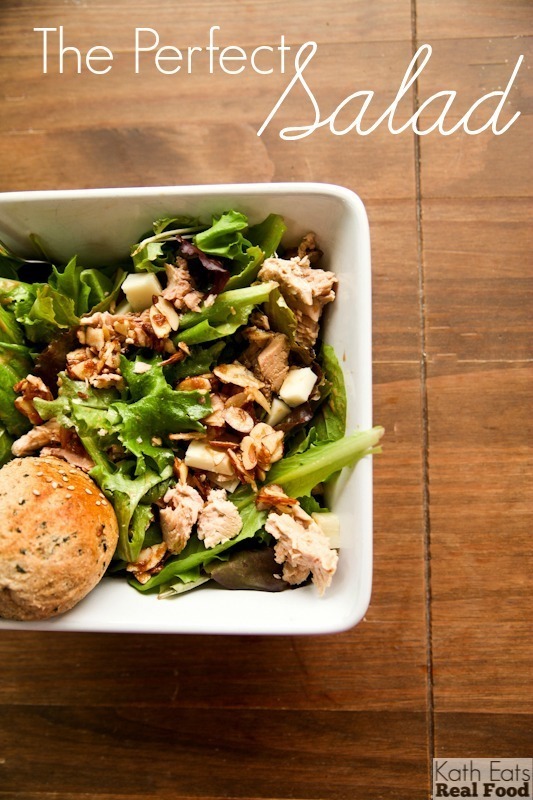 I also love making tuna salad and using that as a topping/dressing for my salads. My ideal salad is a great mix of sweet and salty. Lots of berries, nuts, and goat cheese. I’m lucky to work at a company with a big (subsidized) cafeteria… with a huge salad bar! My favorite is a bed of baby spinach, topped with broccoli, red pepper, shaved carrots, beets, and a little bit of hummus, blue cheese, pumpkin seeds, and cranberries. Yum! YUM! I love HUGE salads! My favorites I usually call the “garbage bowl” salad as it contains all the leftovers thrown on a bed of fresh greens. SO good! One of my all-time favorite salads is steak and blue cheese with a balsamic vinaigrette! Yummm, that dressing looks and sounds amazing! Candied nuts, avocado, olives, shredded chicken and bacon or leftover roast lamb….greens (spinach, kale, shredded brussels) and a homemade mayo dressing is my idea of the perfect salad! Yummers! I’m loving walnuts, goat cheese, fried digs, and delicata squash on a bed of mixed greens. Yum! Love salads! Even the most salad-averse would want to eat salads every day after seeing this! 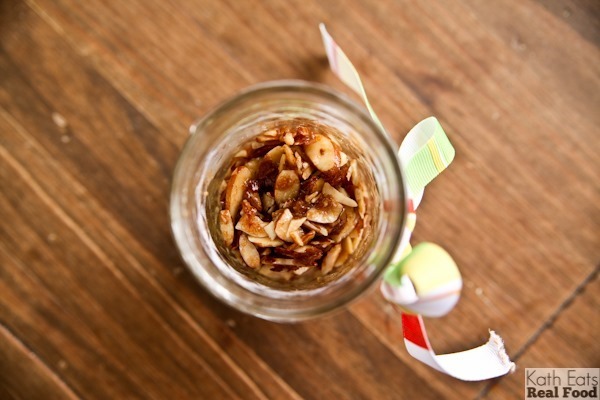 Love the idea of using candied nuts. Microwave candied nuts = GENIUS. My favorite salad is arugula, beet, walnut and goat cheese. Mmmm! Although at this very moment, I am eating a mixed salad of green peas, lentils, dried tomatoes, red onion, hard boiled egg with sesame oil, peanut butter and wine vinegar dressing over spinach greens and fresh basil leaves. It’s a touski salad, in French “tout ce qu’il reste” means: everything that’s left. 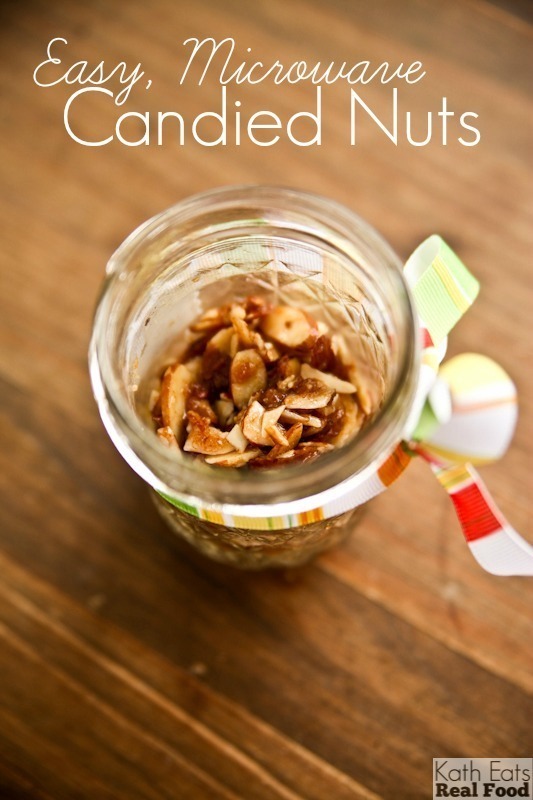 Can’t wait to try this quick and easy recipe for candied nuts!!! I thought the croutons Matt put on our salad the other day were the best ever! (Made from Great Harvest stuffing bread). My favorite salad usually has a blob of hummus on top! Completely off topic, but I’d love to hear where you’re watching the old survivor seasons. I’d love to go back and watch them all, but not sure where they’re all available without paying a ton. And nuking the nuts? That’s like money the bank! Thanks for the tip. I watch them on Vudu, which I get through my Bluray player. They are $9.99 a season, but then they are HD and I own them forever and can watch them on the big TV rather than a computer. They have seasons 9 through the current season, but not the first ones, so we found those on DVD via eBay and things. Thanks! Never heard of vudu. I’ll check it out. I love building salads full of fresh veggies (& fruit), whole grains and delicious cheeses. For me, I think the perfect salad would have lots of greens, fresh fish, some yummy cheese and seasonal fruits and veggies, plus a sourdough roll on the side. I agree – I need some carbs to make myself feel truly satisfied and full. That salad dressing sounds so good!! I can’t wait to give it a try. My favorite additions atop my salad recently have been sun dried tomatoes and a nice crisp fall Apple! I love adding fruit to my salads. OK, I’m just going to throw this out there. You’re not going to believe it. You know what I’ve been loving lately? Here goes! McDonald’s Souhwest salad with Paul Newman balsamic dressing. It’s really quite tasty. I love a good salad, but am not a fan of making my own. There are a couple of nicer restaurants in town where I always get a salad, a Cobb salad at one, and one called Oregon Bleu Cheese. It’s very good and comes with a few chunks of spicy Buffalo-type chicke. wow, yum! I love a strong cheese in a salad! This is such a great idea and so true! If a salad is all vegetables, I’m never satiated more than a few minutes! I’m sharing this with my mom and we will have to make it over the holidays! My favourite salad topping at the moment is a beautiful seed, herb and edible flower mix that I picked up on a trip to Switzerland over the summer. It makes the salad look so pretty! !